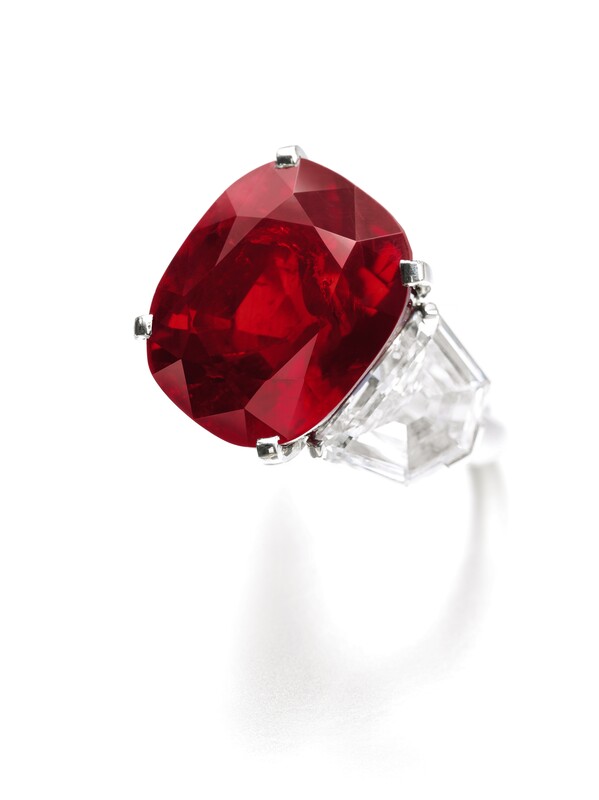 Sotheby’s Geneva marked the highest total for an auction, last May 12, by realizing US$ 160.9 with the 94% of lots sold, an outstanding result that includes the world auction record for a ruby. The new world auction record for a ruby has been set with the sale of The Sunrise Ruby, an exceptional and incredibly rare and untouched by heat treatment “Pigeon’s Blood” 25.59-carat Burmese ruby, sold for US$ 30.3 (versus an estimate of US$ 12-18m). The price also established a new record both for any ruby per carat and for any stone by Cartier – mounted by Cartier and weighing an exceptional 25.59 carats, the stone’s world record price reflects its extraordinary size and outstanding colour. Another outstanding result came from the sale of The Historic Pink Diamond, an extremely rare and highly important 8.72-carat Fancy Vivid Pink diamond, which has been linked by GIA to the outstanding collection of Princess Mathilde Bonaparte, niece of Napoleon I, and which achieved US$ 15.9. This exquisite stone only recently resurfaced, having been kept in a bank vault since the 1940s. Boasting VS2 clarity and mesmerising colour, the stone is also remarkable for its classic non-modified cushion cut, unusual in a pink diamond and highly sought-after shape for connoisseurs of the very fines precious jewels. Out of the same collection, The Sunrise Ruby belonged to, three additional sensational modern creations by Cartier ranked among the stand-out jewels in this sale. A magnificent diamond necklace, “Ivresse”, with diamonds for a total weight of more than 190 carats sold for an impressive US$ 7,244,057. Custom-made for the owner, this captivating creation is designed as a cascade of diamonds, the front accented with a floral motif and suspending a fringe on nine pear-shaped stones. A new world auction record price for a ravishing Kashmir sapphire jewel was established by a ravishing brooch set with a 30.23-carat sapphire which achieved US$ 6,161,637. The Swiss Gemmological Institute describes the sapphire’s colour as “velvety and saturated”, due in part to a “combination of well-balanced trace elements in the gemstone, typical and characteristic for the very finest sapphires of Kashmir”. Matching this brooch, and completing this stunning private collection, is another world auction record has been set for a pair of Burmese sapphire earrings, made by two exceptionally well-matched Burmese Mogok sapphires, which achieved US$ 3,425,518. These two sapphires exhibit remarkable weights of 16.909 ct and 15.776 ct, respectively, forming then a perfectly matching pair in size, shape and attractively saturated blue colour, combined with an excellent purity. Their saturated blue colour is due to a combination of well-balanced trace elements in the gemstone, typical and characteristic for the finest sapphires of Mogok, Burma. A stunning tiara created by Cartier in the 1930s found its new owner for US$ 2,587,930. Of geometric design, this tiara delightfully expresses the era in which it was created. Another exquisite and intricate diamond tiara from the Lady’s collection, dating from the 19th century and that can also be worn as a necklace, was sold for US$ 848,326 after a prolonged five minute battle between two bidders in the room. The tiara is composed of fleurs de lys and confronting scroll motifs, delicately swing-set with a graduated row of twenty superb pear-shaped diamonds. Natural pearls were once again highly coveted, with connoisseurs being very active in the room. One of the piece attracting the attention was this superb and extremely rare natural double-strand pearl and diamond necklace, composed of seventy-eight splendid natural pearls, bought for US$ 7,003,519 – a new record for a two-row natural pearl necklace. Composed of two graduated strands of seventy-eight natural pearls measuring from approximately 7.45 to 13.95mm, on a clasp set with a marquise-shaped diamond weighing 4.39 carats, framed with brilliant-cut diamonds, clasp signed Cartier. A pair of magnificent natural pearls and diamond pendent ear clips by Petochi saw bidding reach US$ 3,232,228. Craftsmanship was also celebrated, thanks to selected signed pieces, among which an important ruby and diamond bangle-bracelet by Boucheron (US$ 977,185). Of hinged design, the jewel is decorated with rubies in a concealed setting, and has been in the collection of a European Imperial Royal Family. French design was also represented by a striking 1960s gem-set and diamond demi-parure by Jean Schlumberger, which was bought for US$ 174,497. Tonight’s record result is the reflection of the outstanding quality of the pieces in the sale across the board. The ‘Sunrise Ruby’ captivated me from the moment I saw it – such an exquisite stone truly deserved the multiple-record-breaking price this evening. The exceptional results achieved for the other Cartier jewels in the sale – including two world auction records for sapphires – and for ‘The Historic Pink Diamond’ are evidence that the market for exceptional jewels is going from strength to strength. The galleries have been brimming with collectors during our worldwide exhibitions, and this translated into lively bidding throughout the sale tonight with truly global demand for the finest diamonds, gemstones and signed pieces of the very highest order. Edited by Claudia Carletti Camponeschi. All material courtesy of Sotheby’s.